Joel Salatin, proprietor of Polyface Farms and highly-visible champion of sustainable farming, thinks modern humans have become so far removed from a natural connection to the food they eat that we no longer have a true understanding of what "normal" food is. The rise of Big Ag and factory farming over the past century has conditioned us to treat food mechanically (as something to be recoded and retooled) vs. biologically. And we don't realize that for all our industrialization and optimization, we're actually getting less yield and less nutrition than natural-based processes can offer. Whether we like it or not, the arrival of Peak Oil is going to force us to realize that our heavily-energy intensive practices can't continue at their current scale. And with world population still increasing exponentially, we'll need to find other, more sustainable ways of growing our food. "What we view today as "normal," I argue, is simply not normal. Just think about if you wanted to go to town 120 years ago. If you wanted to go to town, you actually had to go out and hook up a horse. That horse had to eat something, which means you had to have a patch of grass somewhere to feed that horse, which meant you had to take care of some perennial in order to feed that horse in order to go to town. And so throughout history, you had these kinds of what I call ‘inherent boundaries,’ or brakes, on how much a single human could abuse the ecology. And today, during this period of cheap energy, we’ve been able to extricate ourselves from that entire umbilical, if you will, and just run willy-nilly as if there is no constraint or restraint. And now we are starting to see some of the outcome of that boundless, untied progression. And so the chances are, the way to bet, is that in the future we are going to see more food localization, we are going to see more energy localization, we are going to see more personal responsibility in ecological lifestyle decisions, because it's going to be forced on us to survive economically. We are going to have to start taking some accounting of these ecological principles." Joel, his family, and the team at Polyface Farms dedicate themselves to developing environmentally, emotionally, and economically-enhanced food prototypes and advocate for duplicating their production around the world. In this interview, Chris and Joel explore what constitutes truly sustainable agriculture and the reasons why our current system has departed so far from it, as well as practical steps individuals can take to increase their own personal resiliency around the food they eat (in short: "find your kitchen," source your food locally, and grow some yourself). 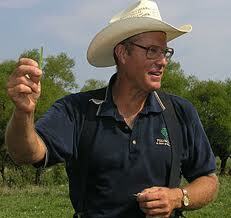 Joel Salatin is one of the most visible and influential leaders in the organic food and sustainable farming movement. His family owns and manages Polyface Farms, which has been featured prominently in such modern food movement works as The Omnivore’s Dilemma by Michael Pollan and the film documentary Food, Inc. Joel’s unconventional but highly innovative farming practices are inspiring millions to increase their nutritional and community resiliency by seeking out local sources of chemical-free food raised using natural process-based farming practices. These practices have been documented in the many books he has authored, including You Can Farm: The Entrepreneur's Guide to Start & Succeed in a Farming Enterprise (1998), The Sheer Ecstacy of Being a Lunatic Farmer (2010), and the upcoming Folks, This Ain't Normal: A Farmer's Advice for Happier Hens, Healthier People, and a Better World (available for pre-order). Joel is the man ! A tireless and thoroughly entertaining evangelist for sustainable, healthful eating ! But serious kudos to Adam and Chris for having such a powerful guest. Even some of us that think we get it, really don't. Joel gets it. I hope to some day! Suh-weet. Joel is just an amazing individual that does "get it" on all levels and expresses it all eloquently and passionately. I look forward to listening tonight. It is interesting that I was introduced to him on this site quite some time ago. Thanks, JAG. Joel's inspiration has led me down a new path in my life with a little project in Oklahoma. The neighbors think I am crazy. I know better. It is people like him that give me some hope for our future. I Have put the kettle on and shall listen to the podcast now. A picture tells a thousand words, and your two pictures are eloquent. The farm is real wealth. Joel is in fine fettle. He must be doing something right. The mind races like a squirrel harvesting nuts. Have you read "The one straw revolution"? The reason we have to go through a crisis is because the western mind has become dominated by the Left hemisphere. Our models have become our Reality. Our left hemisphere "knows" that if the model is wrong, Reality itself will disappear in a puff of smoke. Hence we need a crisis af greater magnitude than the disapearence of Reality to destroy the dud model. This is why I commented on the pictures above. Pictures are a gestult, Right hemisphere response. And the Right has a monopoly on Insight. Chris, Excellent interview! I first saw Joel a month or so ago when watching Food INC. He is a vast source of knowledge, humour, and plain old common sense. His commentary and the documentary changed our perception of what constitutes a sustainable diet...And consequently the way we eat, live and plan for our future. Thanks for a great interview. More Rural Heritage Stuff please! Wow - this is just what I needed today. Again, I'm reminded I need to be able to grow more calories than I consume and this was a perfect interview with a great thinker and fore-front to getting back into sensible ways of living. There is so much I like about Joel's way of thinking and way of life. But here in the north we have to do things a little differently and a lot of it requires working over the growing seaon to put away what is needed until next harvest. This means incorporating any and all energies Jole talked about but I think he left out the draft animal as a resource. I remember reading about the old ways and how beforel the 1800s, most towns shared the cost and expense of the local draft animals as they provided service for all the people's needs (plowing fields, clearing land, logging and as transportation. We hardly have enough animals as it is to meet the demand we use now, but it seems a good investment to learn or invest in local working animal skills. . .in a romantic sort of way. But I think it adds one more option to the alternative energy list that is not openly addressed. And Joel touched on why my neighbor's chicken raising distubed me. They pay for grain. If we have chickens, hopefully soon, they will be fed scraps. Honestly, grain will be too expensive to spend on animal feed. For that, we plan to have non-picky, herbivore rabbits. Joel sort of validated our plans for our small suburban homestead, that that felt wonderful. I'll look forhis book now, too. The reading room in the Rural Heritage just tickled my funny bone . I am more grateful than ever that my family has passed down these traditional ways . Last week my 7 yo grandson was big talk when we were butching roosters and very disapointed that he did not have the strength to whack heads . He did OK with the feathers .. hightailed it for the gutting . I am thinking there may be a lot more vegetarians in the future or Butchering will be a man in demand job . Train your children well is all I can say . I was encouraged to see that the public school was offering classes in food preservation and baking classes .. and opening it up for adults . That they now have a local growers co-op and that the Superintendent's wife has purchased the local greenhouse business and is opening it for people to come plant in during the winter months . Offering Hunter Safety courses and now has an AG teacher with family farming back ground replacing one that was just a welding teacher . Baby steps but steps forward none the less . I think it's not a bad medium-term strategy to import a little bit of nutrients and biomass in the form of chicken feed if you understand that it might not be available at an affordable price in the long term, and plan accordingly. You will get a LOT more egg or meat production by feeding the chickens, I mean the difference between a few eggs a week and eggs every day. Every year, you will be improving your soil, and that will make it a lot more productive over the long term. Salatin himself used grains in his chicken operation in its earlier incarnation (the "Salatin" portable pens he featured in his book, Pastured Poultry Profit$.) I don't know if he still does, but I do know that he transitioned to the day-range system. It's a testimony to the man that, when he saw a system that worked better than his own, he changed to it. Now there are a few ways to supplement the chicken's feed without buying commercial feed or even making your own from exogenous grains. If you have enough land, you could put in a corn or soybean patch, recognizing that you are still probably going to need to come up with a way to bring in fertility. Amaranth and quinoa can be grown in backyards, and while I have never known chickens to be very fond of them, they could probably be prepared in a way that they would utilize them. Maybe you could partner with a small local market gardener for the production of a few acres. You could salvage grain foods from local bakeries, grocery stores, or restaurants. Anyway, just some food for thought. Don't let the perfect be the enemy of the good. Great interview. I think one thing North Americans should be doing is promoting bison as a meat source, since they are ideal out on the range and they are healthier than beef. This would also be a way to bring back prairie ecosystems that have pretty much been lost since we converted virtually all the prairies over to mechanized plant production, to supply feedlots. We could have kind of semi-parks, where big swaths of land are returned to natural processes with roaming bison which are culled X% on a yearly basis to provide meat for us. The other benefit of bison is that they tend to congregate in higher ground so they don't spoil riparian areas, whereas cows like to make a mess down in the mud. And speaking of sourcing your nutrition locally, an interesting tidbit is that the deep rich soils of the great plains are actually largely the result of the loess deposits from dust blowing off the Sahara and getting deposited in North America. But it is easily degraded by poor agricultural practices, and we have diminished our inherited ecological captial over the last 100 years in our poor treatment of our farmlands. And Joel touched on why my neighbor's chicken raising distubed me. They pay for grain. Mr. Salatin pays for grain for his chickens, as well. He has special mixtures for both his pasture raised broilers and his layers. Chickens in most settings cannot live well on grass and bugs alone. Cattle still rule for converting sunfed grass to tasty protein ! It's true that Joel does use chicken feed, but my understanding is that it is purchased from a local supplier. The feed is not "certified organic" but it is GMO-free. Chickens in most settings cannot live well on grass and bugs alone. Old-fashiioned dual-purpose birds can do just fine on forage and bugs. What you won't get is rapid growth or high egg production. If all you want are a couple of eggs a week, or just to celebrate a holiday once a year with a home-grown hen, then a couple of yardbirds around the property are a fine thing to have. Heck, even if you never get a thing, they can perform valuable eco-functions around your garden. If you want more than that, or are raising meat birds like the Cornish Cross, you're going to need to feed them. My point was that most of us are never going to be totally self-sufficient, so you need to choose wisely what you want to import. Concentrated, high-energy foods like meat and eggs, or cheaper grains that you can feed to an animal and reap the benefit of the wastes? One thought though: In 2050, let's produce LESS food, not double. Population growth is not like gravity or magnetism or time. It happens because people are made of food, and more food means more people. Conversely, less food means less people. Poverty and hunger have social origins -- they have nothing to do with a dearth of food. The amount of food being produced is a really key issue that we all need to wrap our heads around. Spread the word! I was taken aback to find out, at a bookselling site, that Joel Salatin is a fundamentalist Christian creationist, a very far right wing Libertarian, and an antiabortionist who does not believe government should be involved in education or a host of other services. Too whacky for me! When you go to the supermarket to buy food, do you ask the person selling you the food what their religion or political views are? How about your own local farmers? I've been giving my neighbors some of my extra produce from my 1st year garden. No one's asked me what my religion or political views or whatever are. It's not an issue, don't make it out to be one. Joel can be me neighbor anyday. I see that you are a bit new here, so I wanted to take an opportunity to aquaint you with some of the important premisis of this site. Everything in your post is a logical fallacy, specifically an Ad Hominem. That type of post will not get you very far here. If you have a critique of something the man said in his interview, that is certainly fair game. But we try to separtate beliefs from facts here, and Joel's (or your) beliefs, especially about religion, goes against the grain of the site, as well as the posting guidelines. What I would like to hear is why what Joel says about farming is wrong, inadequate, misleading, or a poor perfomer in your mind. That's really the subject here, not his personal belief set apart from farming. It is very easy to tear down, much harder to build. We still choose to build around here. Fair enough? Oh goody. lets talk about religion. I am always happiest when chewing the fat about something no-one knows anything about. .................. Joel Salatin is a fundamentalist Christian creationist, a very far right wing Libertarian, and an antiabortionist who does not believe government should be involved in education or a host of other services. Too whacky for me! Old nick exists as a meme and confuses everyone. He argues "Evolution proves God does not exist," He comes up with all sorts of wacky arguments. I feel like Mr wack-a-mole. The ancient Vikings never had the luxury of having an anti-abortionist stance. Every time an infant was born a calculation had to be made as to wether there were enough rescources for another adult. If not, fat was placed in the infants mouth and it was left out in the snow. Defective infants were given short shift. Hence the conquest of the world by the descendants of the Norsemen. Eugenics works. We can afford the luxury of anti-abortionism, now. If not, fat was placed in the infants mouth and it was left out in the snow. Hmmmm, not sure I want to chew any fat on your island. It might be fatal. has a sterling reputation in the local sustainable ag crowd. To get off religion and back to farming, i would like to comment on his techniques which we should remind ourselves don't happen either overnight or without effort. Our farm,500acresofit, was largely farmed to death,not to the extent the Salatins' place was but still quite dead as obvious soil life didn't exist. It has taken years to get fertility back, but is has really come around. Point is that the bug out farmette may not be sustainable or sufficiently fertile to meet expectations for years. Robbie, I couldn't agree more. I'm very jealous of the lush vegetation in the pic above. When I first bought my farm, I thought it would be no problem to knock down a few trees and plant a garden. When I got done, I had more rock than dirt. Luckily I am surrounded by folks who will let me take the used horse feed for free, and after 3 years of working it, have good soil. I would have had better luck if I started the garden in the valley, but that would be too far away from the house. When we first started, we had a soil test done. The good ole' farmer who helped us understand the results said "any worm that wants to slither across that meadow better pack a lunch or he 'aint gonna make it." It's taken a lot of sweat and diesel to have happy, fat little worms. To go the natural route, not importing huge qtys of manure, it would take over a decade to get it right. Point is, whoever is planning on going down this road, better get started pretty soon! What Robie says is a reality I've been struggling with for at least 4 years on my 'micro homestead'. Its not easy to grow, harvest, prepare and store food in quantity. Too many people who have a 'preppers' mindset buy stuff, instead of build callouses and knowledge through experience. A can full of heirloom seeds sitting on your pantry shelf might make you feel better about the future, but chances are they won't provide the quantity of calories when you need them. Your personal food growing systems, whether they be fields of amber grain, movable pens of broiler chickens, a coop full of laying hens, or long rows of brocoli and beans have to be hard won by experience over time. Your location, soil condition, microclimate, etc etc etc all impact what you can grow in quantity. Anyone can force a tomato to grow (I'm at Latitude 48 North, which is a bit cold for 'maters, peppers and eggplant without expensive hoop houses or other 'stuff'), but can we afford to force enough 'maters to grow to stock a pantry shelf with 10,000 calories? More? So, if growing your own is something that's on your radar, and you think you'll need to rely on those calories someday, you MUST grow food NOW. We grow about 70% of our own poultry, and about 70% of our own taters, onions, garlic, shallots. These store well. THe weakest link to growing more, and storing it appropriately, is labor. As a back up plan to growing your own food, consider 'sprouting seeds'. It seems like a waste to me to eat a sprouted seed, but for now, you can buy in bulk, and with a couple mason jars, cheesecloth and water, have a gauranteed source of fresh nutrition. Walton Feed in Idaho sells a variety of sprouting seeds in bulk. I'm happier to have a deep larder of sprouting seeds than I am garden seeds, just based on RIGHT NOW nutrition. Now our goal is to produce fresh food year 'round up here. So more expensive hoop houses must be built, and protected from deep snows, high winds, and perhaps some day, hungry visitors. If you want to rely on home grown food, start now. Many seed companies are now offering guidance and seed selections especially for late summer/fall plantings. I was aware of Salatin's religious views, and I don't particularly share some of them, but it doesn't mean that I'm not going to listen to the truths he speaks. His books and various interviews have been very useful and inspirational to me. I was noticing in the interview that there were several questions he could have answered from a religious perspective if he were pushing an agenda, but he mostly kept it secular. Just another reason to admire the man. (we live in a mennonite community, and i attended EMU, it was EMC in the '70's,however am not mennonite) it would be inconsistent to proselatize(sp) The Mennonites i know well "spread the gospel" thru good deeds and loving their neighbor. "on this hangs all the law and the prophets." Some people would rather starve ? I doubt it . ... but whatever ... Joel has great many years of experience and wisdom behind his ways . This thread raises my awareness of building my own trusted community . It is very much work raising your own food and filling your shelves . I doubt there are even many here able to do it without buying outside food . MANY farmers do not raise Milo anymore so I believe chicken feed will go higher yet . The Corn went through a dry spell and did not head out so it was all cut for silage . YUP ,YUP, YUP Grain will go high . Good Luck ALL. ! Note to self ... make sure you do not let sneaky little Bantam Rooster in the hen house ... hatchlings are .. hard to butcher tiny chickens that like to fight . if i could type i'ld tell you how long one must pressure cook a game rooster to make'im tender. if it can crow its tough. We don't raise milo, but will be milling sorghum(pressing is more accurate)for sorghum syrup. the grain is great chicken amendments(they forage for their greatest part)fine ground flour(better than corn meal) and lastly saved for next years crop. Me too ! Robie . I wish I were there for sorghum making !!! are you doing it with Horse power ?? . What all do you use it on ? My husband like a little in his coffee . There is a gal a couple hours down the road that does it and I just need to get over there and watch it done .. she usually does not get over this way until Oct. When we have a harvest dance . I never thought of grinding it for flour !! I am so going to do it !!! We do pop milo like popped corn tho . OLD BIRDS !!!! I told the 13 year old boy if he brought me home an old tom turkey he was going to eat every bite himself . NO PRIZE BEARDS .. LOL The hunting licence are high and the flocks are huge ... so many that the big cats will surely be through here soon enough enough . and talk about foraging .. my chickens got into the garden and pecked at every tomato low enough to reach last week. Thank goodness the tomatoes are climbing high enough that there are plenty to share . This is way off topic but you will get it.. I just missed a sale on a horse drawn hearse It was in great shape and so beautiful ! Our Black Morgan would have been so pretty hitched up to it Anyway I have looked into green burial and we are going to just do it here on the place . Since we own three sides around the old county cemetary up on the hay field and there are no laws against it in 44 states ... Kansas being one . I will just have them dig a hole on the outside of the fence . Anyway all we have to do is the old fashioned way ... Get the body in the ground in 24 hours . My mom said roll her body in a blanket and throw it in the hole . I may even wrap my dad in a horse blanket and tie him to his horses saddle for one last ride . That is if we can find the old guy .. he keeps getting on his horse and taking off without telling us which way he is headed . OK back to harvesting .... the beans are looking awesome .. The wheat was good ,the milo good , It just got too hot for the corn . The grain bins are full . Now if it will cool down some we will haul in some logs to cut for winter . It is going to be bad .. very many heavy foggy days , the walnuts are loaded and other signs of long cold winter . Also the elderberries are everywhere so I will not be surprised to hear of a whopper of a virus this winter . So much for the old wives signs ..
Sorghum is malted first to help process the indigestable carbs. Then it is roasted and ground to make Maltabella porridge. Even then it has a low glycemic index. I heard that they are trying to breed a more digestable variant. You can research the internet to see if they succeeded. "Nothing succeeds like a budgie without a beak." We use a prviously horsedrawn chattanooga No.12 mill. It is now PTO powered 18/1 gear reduction to slowher. It can be used 'bout anywhere sugar/honey would be used. Most interesting and now a favorite is to cure hams/baCON in course crush black pepper and sorghum syrup. Our 1/2acre of sorghum will occasionaly produce 40 galloons of syrup. It can be quite a party. My father and his brotheres once got drunk while cookin' cane and when poured and cooled they had 200 quart jars of hard rock molasses candy. Granma had more to say about the evils of strong drink. Shellin' corn,planting barley,then pressing and evaporating sorghum syrup. If any folk are interested and in the area send me a PM and i'll let you in on the party, i mean work. I live near Joel and have a very high regard for him. He has always been willing to share his knowledge with the locals here and appear for speaking engagements for free. I have seen first hand what he has done with his place and use some of his techniques on our farm. Joel now moves 400+ head of cattle around to several other farms (they truck them) to simulate the intensive grazing that took place here in the Shenandoah Valley hundreds of years ago. They bring the chicken tractors in behind them to refertlize and feed on fly larve in the cow manure. I n the winter the cattle are fed hay in the barn and corn is sprinkeled in with the manure which the cattle stomp into the floor. In the spring the cattle are turned back to pasture and he brings the pigs in to root up the kernels of corn and turn the hay and manure into compost this goes out on the fields as a very high grade of finished compost to give the grasses a boost. and the cycle starts again. No chemical fertilizer, all processes working together the way nature has for millions of years. If you want to see Joel in action he is in a new documentary called American Meat, check it out it is worthwhile. Why does everybody buy into the nonsense of peak oil? According to the last report I saw there is 2041 years of unrecovered, untouched recoverable oil in the Bakken formation in this country. Why can'r we just get the environmentalists out of the way? Think Sheriff Joe's tent city for instance. I don't know if you're a troll or just badly uninformed, but either way take the crash course. Then try again. Super interview, really like the diversity of guests and topics, keep it up. Has anyone read any of Joel's books and would they be of interest to the serious backyard farmer as well as commercial operators? I'm especially interested in learning how to butcher chickens efficiently. I rotate my chickens around to different parts of the garden as part of the cycle after harvest and before planting, and the soil seems to really benifit, no tilling required. Whatever veggies I don't eat they do, producing eggs and compost in return, and they keep the grass mowed down too! Meanwhile, I see folks around me spending all their time mowing the lawn, bagging grass (which I gladly take), then driving to the grocery store to pay money for lesser quality food then I get with 100' of my house. Yes its a lot of time and hard physical work to produce your own food; my arms are beat up from diggin up 200 lb of potatoes yesterday! ; but it's more than offset by the rewards. There are some great youtube videos on processing by Salatin as well as others. On processing, I think the videos will help more than any of his books. Joel is my neighbor ( 8 mi). We get our feed from the same family farm in our county where all of the grains and legumes are gmo-free and locally grown. Not organic, but low spray. I don't even know if modern, or even old breed chickens could live without some input, but we certainly wouldn't have the production we want. When I don't a have pig, all my scraps go to the chickens and it's not enough without some chick feed, too. Harvey Ussery is doing a lot with growing worms and other methods to eliminate needing outside feed. While many younger farmers around the country are emulating Joel, I think a lot of the older local farmers resent that he is so successful. He gets a higher price that many rural locals can't afford. I'd love to see him around town more, engaged in sustainability issues. Also, great to hear from some of Salatin's neighbors. We could sure use an example like that in the Mississippi Delta. Thank you for the sites I can study to make it into syrup . Could be that I get overwhelmed and just find a place to get it already made . One place says to use it just like sugar . It takes us 40 gallon of maple and walnut sap to get 1 gallon of syrup .. a whole lot of wood to cook it down ... the boys said it was about enought to cure their sweet tooth . I would not be surprised if you are one popular neighbor to have in the future. Hummm wonder what ppl would barter for the syrup ? Would you share the recipe for using it to cure the bacon please . I wanted to take an opportunity to aquaint you with some of the important premisis of this site. Unless you are an official moderator here, that would be a bit high-handed. Mentioning that the man has an extremist, fringe life- view is very pertinent. We are discussing the man and his ideas, not only the interview. I bought this book looking for practical advice on farming. What I got instead was a multi-page, political diatribe of the author's personal opinions on government, science, and the business of agriculture. This book is a basic slap in the face to farmers who till the earth to actually make a living and support their families. The book is so frustrating and infuriating that I couldn't even bear to give it away - it hit the trashbin instead. Don't waste your hard-earned dollars! We're all grown-ups here, not fanbois. Let's have open discussions without veiled threats. I see you have a list of people you've interviewed for podcasts - all 25 of them are men. Where are the interviews of women? I would like to see input from women. Also in the articles. This world's so out of balance: the economy, the wars, wall street, bankers, congress, IMF, NAFTA, the UN - it's fact these are run mostly by men. Perhaps now is an excellent time to start listening to the voices of wise women and begin to balance the scales. Some suggestions: Catherine Austin Fitts, Elizabeth Warren, Carolyn Baker PhD, Helen Caldicott MD, Leuren Moret, Sarah Edwards PhD, Diana Leafe Christian, Judy Wicks, Jessica Nelson, Jennifer Gray, Joanna Gabriel, Jill Bamburg, Sarah Van Gelder, Lucia Rene, Inelia Benz to name a few. Throwing out Mr. Salatin's advice/ideas is your prerogative. In coming to terms with the 3 Es, we all have to examine the possible strategies we might use to become more resilient in the face of the changes/challenges that are here (and waxing with each passing month). If you don't find Mr. Salatin's methods useful you are free to pursue other strategies vis-a-vis your food supply. But to dismiss his methods of food production because one does not cotton to his personal moral beliefs is in my opinion a losing strategy. As for the review from Amazon, I checked the site and found the review in question. It was the only 1-star review (out of 73). We could likely pick any book from the genre and locate at least one dissatisfied customer, so I don't know what quoting that review is supposed to do other than stir the pot. And I actually am about 20 pages from finishing the book in question ("You Can Farm"). I've found the book useful (I'll be buying "Pastured Poultry Profit$" next). Mr. Salatin certainly spends time critiquing the Big Food/Big Pharma/Big Government complex. IMO such a critique dovetails quite naturally with the rest of the book, since a huge pillar of Mr. Salatin's philosophy involves working with Nature -- recognizing we are a part of it instead of thinking we're outside of it and it is therefore ours to loot as we see fit. YMMV. I also think having a strong opinion is less of a fault than having no opinion at all. I may disagree with somebody's opinion, but I'll respect that at least they're engaged with the issue instead of marinating in apathy/ignorance. If what I've read on this thread is true, I differ in many respects from Mr. Salatin philosophically. But from what I've read in his book and seen in a couple of documentaries, I will happily defer to him on matters agricultural. Actually, I have found Mr. Salatin's books to be quite instructive. Especially Pastured Poultry Profit$ and Salad Bar Beef. The Amazon reviewer sounds as though he/she might be one of those people that refuses to accept new ideas and is jealous of those that are using the ideas to improve their lot. Joel has mentioned that he has changed some of his techniques to ways that, when first mentioned, he felt would not be successful. scribe, you mention something about discussion. Let it begin with you. Maybe we could talk about the pros and cons of deep bedding or maybe worming techniques or maybe whether or not increasing the carbon content of the soil is beneficial. Thank you for bring up the idea that we need to consider and learn sprouting . I recently read a story of how some people survived a fairly recent collapse in their country and how others in the same family did not because they would not get out in the city and eat the weeds . It is so easy to become complacent in the situation we are in . So many years of easy living and easy food from the market .. It is hard to even wrap our mind around people are actually going through such at this very moment in time . This lady's account told of how important it is to know how and have things hidden . We do not like to think doom and gloom in our ivory palaces but it is out there and we are not above such things happening to us. How will we feel if our own pride and stupidity caused our family to suffer . Even this year when a lot of the fruit was frosted off caused us to have to consider getting more than just one years supply preserved . I see my attempt to help you understand the implications of using a logical fallacy as an argument on this site both fell on deaf ears, and actually resulted in you employing 2 others in your response. Now, I won't go thru and highlight all the areas that you are coloring outside the lines on this one, you can see that for yourself. We have been asked to self moderate by the owner of this site. You are new here, and I understand you may not have seen this, however it is real. Often times folks come here from ZeroHedge or other similar sites where anything goes on the forums. This is not ZeroHedge. We have been asked to self moderate by the owner of this site. If by "self-moderate" you mean not mentioning that Salatin speaks from a creationist, far right wing viewpoiint, then No, I will not be self-moderating. It's a pity he's of that mindview, because he has some interesting ideas. Who else is like Salatin, but better, and comes without all the extremist claptrap attached? I nominate Gene Logsdon, author of some fine books on the same topics as Salatin, and with a lot of the same content, but this time with wisdom and humor. I'd like to hear Chris interview him. I like Joel Salatin too much to see this forum banished to controversial topics. I assume that you will be censored if you don't self regulate. It has been really hard for me to self regulate myself and keep my fingers off the keyboard firing off a knee jerk response. Of course if Joel were here himself he could definitely defend himself. He was an English major, and he does love to express his opinions. If you spend some time on the land, it will cause you to develop a spiritual sense, whether it is in line with Joel's or not. When I think that people have been farming over thousands of years, and he comes and discovers these new techniques with some electric wire and respect for the creatures and the ecosystem...now that is amazing! At CM.com one of our key guidelines for discussion is to stick to the relevant facts. It is true that drawing attention to the beliefs of a speaker is not necessarily an attack ad hominem. It can conceivably be evidence which goes toward the reliability of the speaker. I.e., if it can be shown that the speaker believes that space aliens are responsible for rush-hour traffic in New York, then we can infer that their logic is not reliable and may be prone to error in other matters as well. However, in this case there is no way to prove out this hypothesis without first settling the evolution/divine creation debate. This debate would be nearly impossible to conclude because some religious authorities (such as the Roman Catholic Church) have concluded that evolution and divine creation are not mutually exclusive ideas. Without more detail about exactly what Mr. Salatin's scientific beliefs are, the debate couldn't even begin, and it certainly would never find an end. I also draw your attention to our prohibition on discussion of religion, which exists for good reasons. Furthermore, Mr. Salatin's interview is detailed enough that it can stand on its own. It cites independent facts which can be directly supported or controverted. There is no need to inquire into the reliability of his logic, because his logic in the interview has been laid out for all to see: we can apply our own logic to what he says. I agree with Ready and the other users that questioning Mr. Salatin's private beliefs in other areas is not an appropriate or constructive avenue of discussion. It will be much better to stick to the facts of the interview, and leave everybody's personal beliefs aside. Let's do so. On a different note, when a veteran site user attempts to explain how our forum rules work, they are entitled to deference. Moderators cannot be everywhere at the same time, and a new user who defiantly refuses to listen to guidance from the mouth of any person other than an official moderator is demanding a greater share of time and resouces. You may ignore the advice of veteran users, but do it at your peril. We often give users warnings before more severe sanctions are applied for breaches of the forum rules. But in cases where a user has already been warned by another user - especially if that warning refered to the forum guidelines - then we may well decide to skip directly to a harsher sanction rather than repeat a warning that was already given and ignored. Once you have been warned by another user that your behavior might be a violation of the forum rules, even if you happen to disagree, the burden is on you contact us and ask for clarification. I hope this is helpful to everybody.